We often get phone calls at Sound Marine Diesel from boat owners inquiring about installing a new engine in a sailboat. This article explains the repowering process in general terms. When should you consider repowering? If your present engine is always hard to start, has constantly smoky exhaust, burns or leaks a lot of oil, is low on power, has coolant or water in the oil, or parts are difficult or expensive to acquire, repowering solves ALL these problems. 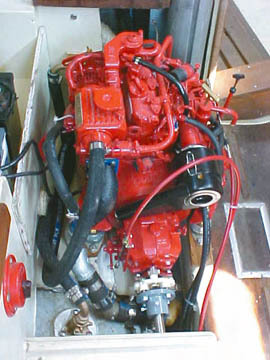 Installing a new diesel engine in your sailboat has many advantages. A new engine has the latest diesel technology. New engines are lighter, smaller, and run much smoother and quieter, with minimal exhaust emissions and superior fuel economy. The new engine and transmission will have factory warranties, with no parts supply problems. You're also able to leave your homeport for far off destinations, confident in the fact that the new engine will get you home in a timely and safe manner. This greatly increases the utility and safety of your boat and removes the "will the engine start this time?" anxiety. After all, she is a "pleasure" boat. Remember, unlike a car, one cannot hitchhike home when your marine engine is broken. Customers ask if rebuilding their present engine is financially feasible. It is usually not so. Parts can be expensive and difficult to find, if they're even available. Rebuilding an engine without rebuilding the transmission is a bad idea, as the transmission becomes the weak link in the powertrain. Old raw water [salt water] cooled engines, such as the Volvo Penta MD7, MD11, Farymann A30M and Atomic 4 gasoline engine, are very poor candidates for rebuilding. They usually break during disassembly, due to advanced internal corrosion, and cannot be reassembled. Also, the internal water passages in the block and head are wasted away to a fraction of their original thickness, with a major and permanent engine failure inevitable. Most machine shops that rebuild engines will not touch salt-water cooled engines for these reasons. There's also a world of difference between a professionally rebuilt engine and a "home rebuilt" engine. It takes a high degree of precision, experience, technical skill, and the correct machine and hand tools to correctly rebuild an engine. This means you must, at a minimum, hire a professional to rebuild the entire fuel injection system, engine head, and correctly inspect, fit, and install the other major components. This costs money that is better spent on a new technology diesel. Considering these factors, most customers choose a new engine for their boat, which actually is the correct financial decision. 1] What make and model boat are we discussing? 2] What make and model engine is currently installed? 3] In what geographic area do you sail? 4] Are you a cruiser, or strictly a racer? 5] What electrical loads are aboard? Answers to the above questions determine the engine we recommend. For example, if you sail on an inland lake with no tidal currents, you don't need a lot of horsepower to drive the boat. Conversely, if you sail offshore, where you encounter large waves, strong winds, and also need electrical generating capacity to operate radar, an autopilot, watermaker, etc., we suggest more horsepower, along with a larger alternator or two. The trend for the last 15 years is to install more powerful engines in sailboats. Some customers want a powerboat when not sailing, and desire a large engine to drive the boat to hull speed, and to maintain speed when encountering wind and wave. In a displacement hull sailboat, this attempt is easily overdone. Remember, the speed of a displacement hull (one that plows through the water, in contrast to one that skims over the water] is limited by the length of her waterline. Once top speed [hull speed] is attained, the boat cannot go faster, no matter how much horsepower is installed. This is because the hull has formed a bow wave, a stern wave, and a trough between them. The boat is sitting in a hole, and cannot climb her own bow wave. Therefore, it will take "X" amount of horsepower to drive a sailboat with a "Y" waterline length to hull speed. We then suggest a bit more horsepower, for reserve power when fighting strong currents and waves. More power than this is not needed or desired, as the boat cannot go faster than hull speed. Why pay for horsepower that cannot be used to drive the boat? One BIG limiting factor in pushing any sailboat is the diameter of the propeller. If your boat can only fit a 12" diameter prop, such as the Tartan 34C, more than 25 horsepower is a waste of money. This is due to the inability of the small prop to transfer greater horsepower to the water. Also, an oversized engine costs more, weighs more, and is harder to service since it fills the engine space more completely than a correctly sized engine. Let's discuss the Catalina 30, an extremely successful design of 6000+ hulls built. Hull speed of this boat, with her 25-foot waterline, is a theoretical 6.5 knots. The boat needs only 12 horsepower to reach hull speed, under ideal conditions [clean bottom, flat water, no wind, correct transmission reduction ratio, and correct prop]. Now, let's add a bit more horsepower to ensure the boat can reach hull speed under less than ideal weather conditions. Sixteen horsepower is adequate. Twenty horsepower is ideal for this boat, as boat speed is maintained under most conditions, while also charging batteries. Remember, the boat is still an auxiliary powered sailboat, not a powerboat. If you must make headway under power into 25+ knots of wind, and the resulting waves, you need a powerboat...and a seatbelt! Repowering your vessel is your chance to install the correct engine for your exact application. To maximize powering efficiency, the engine, transmission reduction ratio, and propeller must work together. Don't assume that your present transmission ratio and prop are making the most of your engine's horsepower. Many times when customers complain about poor boat performance, it's because the propeller's diameter, pitch, or transmission reduction ratio do not compliment the engine's power. Your engine should be running at cruising rpm when the boat is at hull speed. Cruising rpm is usually somewhere between 85% to 95% of maximum engine rpm. This will allow the engine to develop its rated horsepower and operate the cooling system efficiently, and will correctly load the engine for maximum service life. There will also be a few hundred rpm in reserve, to maintain hull speed when encountering wind and wave. If you intend to install an engine of "X" horsepower because that's what the boatbuilder did, you may be perpetuating a mistake. That's because it is very common in the boatbuilding industry to install an engine that was purchased inexpensively, regardless of its overall suitability for the application. One example is the Cape Dory 28, displacing 9,000 pounds. The factory sometimes installed a VolvoMD2B engine of 25 horsepower, weighing 505 pounds, which is WAY too much power and weight for the application. The boat simply cannot use all the available horsepower, and the boat is handicapped by the extra engine weight. A much more suitable engine would be one of 13 horsepower, as it has plenty of power to drive her to hull speed, such as the old VolvoMD7A. TheMD7A was installed in the heavier Cape Dory 30, and is smaller and lighter than the MD2B by 120 pounds.Modern designs such as the BetaMarine 13.5 horsepower engine weigh 195 pounds, resulting in improved sailing performance, particularly in light air. Any new engine must be installed to the latest marine standards. This means only certified marine-grade materials be used for the exhaust, cooling, ventilation, electrical, control and fuel systems. These specialized parts and materials are not available at Home Depot. The American Boat and Yacht Council (ABYC; abycinc.org) publishes voluntary engine installation standards for small craft. The most common mistake boat owners make when repowering is to duplicate the old exhaust system currently. This results in a new engine being installed to an outdated standard, and puts it at risk for major damage. A wet marine exhaust system is a critical installation in any sailboat. It must be designed and installed to prevent raw water from backflooding the engine, and also have minimal restrictions to allow the engine to freely breathe. Backflooding is very damaging to any engine.Major repairs are likely if salt water enters the cylinders. This can occur when sailing (engine off) in a following sea, or when the boat is pitching or heeling, thus swamping the exhaust through hull.We prefer a through-hull with an integral flapper valve, as it provides another layer of protection against backflooding. The ABYC says the exhaust through-hull must be installed where it will not be underwater during the normal operation of the boat. The ideal location is in the middle of the transom. If this is not practical, the through hull-should be located as high and as close to centerline as possible. The old practice of locating the exhaust through-hull on the counter is a bad idea, as it will be submerged whenever the boat is underway. Most sailboats also need a high-rise exhaust elbow on the engine, to help prevent exhaust water from flowing backwards, and possibly entering the cylinders. It was common in the past to make the high-rise elbow from cast iron pipe. This caused many problems, such as excess weight being bolted to the engine's exhaust manifold, high exhaust restriction from using several 90-degree pipe elbows, and limited service life due to corrosion. Modern marine engines usually use a one-piece stainless steel high-rise elbow to eliminate these problems. A waterlift type muffler must be installed to assist the engine in discharging the exhaust water up and overboard. The muffler is located at the lowest point in the system. Its primary function is to capture exhaust water when the engine is shut off. This will help prevent water from backflooding the engine. Its secondary function is to muffle exhaust noise. Avoid the thin, blow-molded plastic mufflers, as they will melt should the raw water supply be interrupted. The old stainless steel mufflers corroded internally from hot salt water, and developed leaks. A heavy duty, heat resistant fiberglass wet muffler is ideal, as it is indestructible. Exhaust system hose must be certified for that specific use, and should be secured using "T bolt" type hose clamps. These clamps are highly recommended for this critical application, and are far superior to worm drive type clamps. We always use 3M 5200 adhesive sealant on exhaust hose connections, to eliminate exhaust water "weeping" and any possible minor exhaust gas leaks. Ideally, there should be "soft wall" (no internal wire) hose between the engine and muffler, for maximum flexibility. The remaining hose is usually the wire reinforced and corrugated type, so it cannot kink when bent into a tight radius. A vent loop, or siphon break, is needed on any engine that is installed at or below the waterline. Its function is to introduce air into the exhaust system, to break any siphon action that may occur when sailing. We prefer the minimally restrictive type, with stainless steel tubing and a plastic valve. It should be installed as close to centerline as possible, and at least two feet above the static waterline. We usually install them under the bridge deck. The exhaust hose should run vertically from the muffler, to the highest point in the exhaust system. We like to see the highest point well above the underside of the cockpit sole. From there, it should run downhill to the through-hull. If room allows, an additional loop of exhaust hose can be located just inside the transom. This will force any backflooding water to work against gravity instead of easily entering the exhaust system. Alternately, a one-piece plastic exhaust part, shaped like a compact saxophone, can be installed for this function. If a marine check valve can be installed, it will assist in keeping that new engine from drowning. Remember, all exhaust components must work together to help prevent engine backflooding. A correctly designed wet exhaust system will have several of the aforementioned items to help prevent this potential engine disaster. The location of the fuel tank deck plate has caused many problems. 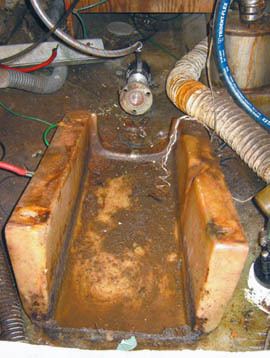 Many old boats have the fill located in the cockpit sole, which reminds us of a bathtub drain. Any water that enters the cockpit will attempt to get past the fill, and enter the fuel tank. We strongly suggest relocating the deck plate to a winch island, where standing water cannot accumulate over it. We prefer all stainless construction, as plastic can warp in the sun. All deck plates rely upon a rubber O-ring to seal out water - check yours for condition. There must be a ground wire of at least 6- gauge copper, electrically connected between the metal deck plate and the fuel tank, to remove any static electricity produced when refueling. Use only USCG approved fuel hose for the tank fill and tank vent. A shut off valve at the tank is also required. We highly suggest the fuel tank be removed for cleaning at a radiator repair shop, and pressure tested for leaks. You can reuse the tank if it passes the test, or replace it with a "below decks" approved marine plastic tank. Galvanized steel tanks cannot be used with diesel fuel, as diesel will remove the galvanizing, (zinc plating) and contaminate the fuel system. Ask the tank cleaner what metal your fuel tank is built from. The standpipe (fuel suction pipe) inside the fuel tank may have a screen installed. Remove it permanently, as they can clog and strand you at sea with a very difficult repair. Standpipes are usually a bit shorter than the tank is deep. This was to keep any contaminants inside the tank, and have the engine draw off only clean fuel. It also ensured that during rough weather, the accumulated sludge would be stirred into the clean fuel, overwhelming the fuel system and leaving you with a non-running engine at a critical time. We suggest the standpipe be extended with nylon tubing, to lay along the bottom of the tank. Now, your fuel filter will continually remove any contaminants, and maintain only clean fuel in your tank. A refinement is to pre-filter all fuel BEFORE it enters your tank with a funnel designed for such use. Racor makes several models that will remove all water and grit. The fuel feed system should use US Coast Guard grade A1 marine fuel hose, which meets the highest standards for chafe resistance, fuel permeation and fire resistance. Copper tubing is not allowed, as it's electrically conductive and subject to work hardening, impact damage and leaks. A fuel filter/water separator must be installed, as diesel engines MUST HAVE very clean, water-free fuel to operate. The Racor model 500 with clear sediment bowl is preferred. It's a simple, top loading design, and filter elements are common and inexpensive. Also, it will trap and hold a cup of water, to protect your engine's expensive fuel injection system. A drain is provided so you can manually remove water and junk BEFORE it can move along to the engine. The Racor filter should be installed outside the engine space, where the fuel is not subject to engine heat, which can result in a loss of engine performance. Leave room above the unit for easy element removal and replacement. Secure the fuel hoses to bulkheads with stainless clips that have rubber chafe protection. Marine-grade stainless steel hose clamps with an additional band of metal under the screw slots (called lined clamps) are ideal, so the hose is not damaged by the clamp. • A scoop strainer (mounted outside the hull) has no place on a sailboat, as they can force water past the raw water pump while sailing, fill the wet muffler, then allow water to backflow and enter the engine cylinders. They also will not allow bottom paint to be placed inside the through-hull, and cannot be easily inspected for barnacles or other restrictions. Much better is a common mushroom head bronze through-hull that is easily maintained and inspected, even with the boat in the water. 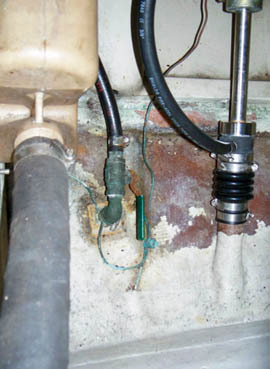 A certified marine seacock, preferably bronze, and of ball valve construction, should be installed to ABYC standards. • A ball valve, commonly seen just screwed to a throughhull, is a very poor substitute. We remove inferior or incorrect through-hull/valve installations, and insist the customer not compromise when keeping the ocean out of the boat! BEWARE the cheap ball valve designed for shoreside installations. If the boat should sink, the insurance company will rightly refuse the claim. • A bronze raw water strainer, with clear bowl, designed for use below the waterline, should be installed inside the boat. The plastic type (designed for bait wells, fresh water systems, etc.) is not suitable for this critical application. The strainer should be located where it's easily observed and maintained. The hose between the ocean and the engine must be of wire reinforced, below waterline marine certified type, so it will not collapse under raw water pump suction and cause the engine to overheat. We actually saw a boat where the owner had used common garden hose, and he was dumbfounded when we immediately ripped it out. Your engine can be plumbed to heat fresh water for cooking and showers. Heating this water is "free" and it will be available whenever the engine has run for about one hour. This requires the installation of a water heater tank with an internal heat exchanger. If the tank is located at the same level, or higher than the engine, a remote header tank must be installed at the high point of the system. This will ensure that the engine's cooling system will not get airbound, and possibly overheat. An ideal location for the remote header tank is just inside a cockpit locker, where it is easily observed and maintained. A translucent plastic coolant recovery bottle is highly recommended, as it will assist in purging all air from the cooling system and allow checking the coolant level at a glance. All diesel engines need lots of fresh air for combustion. Ideally, a blower, wired to the key switch and designed to automatically run and shut off with the engine, should be installed to create a minor vacuum inside the engine space. The hot air suction hose should be located high and aft in the compartment, while the cool air intake hose should be low and forward, to completely ventilate the engine space. Alternators produce heat when operating, and the fresh, cool air provided by this system will contribute greatly to the service life of all components subject to engine and alternator heat. An excellent upgrade from a 2-lever engine/transmission control system is a single lever control. This facilitates simple, intuitive engine operation, and ensures that the transmission can only be engaged when the engine is running at idle speed. That's important when approaching your slip a bit too fast! The control panel should be mounted where it can be reached and observed without leaving the helm. Otherwise, starting and stopping the engine and watching the gauges will be difficult and distracting. The stuffing box (or packing box) causes many problems, mainly because it gets ignored. We like the traditional bronze type, with Gore-Tex packing. If the packing nut is correctly adjusted on a smooth prop shaft, and engine alignment is correct, it will not leak at any time. My personal Catalina 27 had a new stuffing box and prop shaft installed in 2007. I have done nothing since the installation, and it does not leak, period. We do not recommend the so-called "dripless" prop shaft seal. In our experience, they solve a problem that does not exist and we refuse to install them because they're unreliable. The bronze type is cheaper, easier to adjust and maintain, fire and impact resistant, supports the prop shaft, is simpler and MUCH more reliable. These characteristics are very desirable at sea! The stuffing box hose (stern tube hose) should be replaced during a repower, for reliability. Use hose intended for this application - nothing else will do. Also install new T-bolt type clamps for this critical installation. The cutless bearing supports the shaft, and is located just forward of the prop. Inspect it for wear or cracking of the rubber lining. If a new prop shaft is installed, a new cutless bearing is required. Stainless prop shafts are now standard in the industry, as they are less expensive, stiffer, and harder than bronze shafts. The "overhang" (length of prop shaft between the cutless bearing and the prop) must be no greater than one shaft diameter, to avoid shaft "whip" and premature cutless bearing wear. Your old prop shaft MAY be reusable, if it passes inspection. Most prop shops will check it for free. It should be inspected for straightness (within .003" along its length), corrosion and wear. Shafts can be straightened at prop shops, although it may be cheaper to buy a new shaft. Have the shop "fit and face" the new coupler to the shaft, so these parts rotate concentrically, to minimize vibration. We recommend 2-blade props for sailboats, unless you must regularly fight strong wind, waves, or current. A 3-blade prop will provide more thrust under those conditions. The tradeoff is increased drag under sail. An excellent compromise is a 2-blade prop with large blade area. It is less expensive than a 3-blade, but will provide most of the thrust, along with the reduced drag of a 2- blade. Joe DeMers has been in the marine industry as a certified marine diesel mechanic for 30 years. He started his business, Sound Marine Diesel LLC, in 1997, and sells and installs Beta Marine diesel engines and generators.